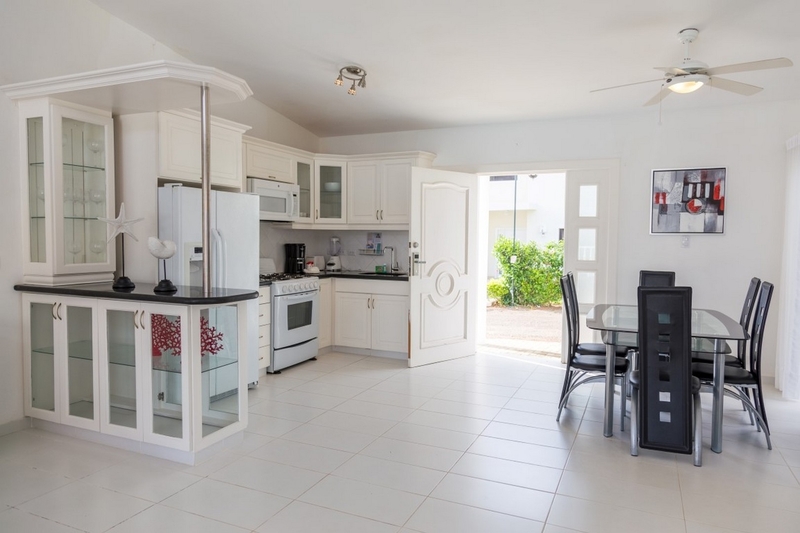 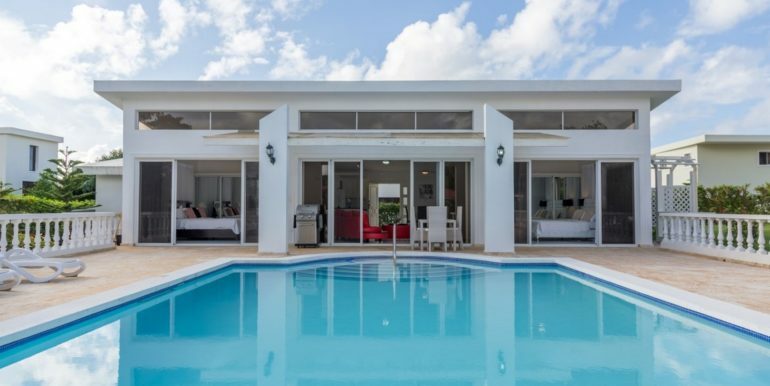 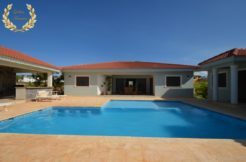 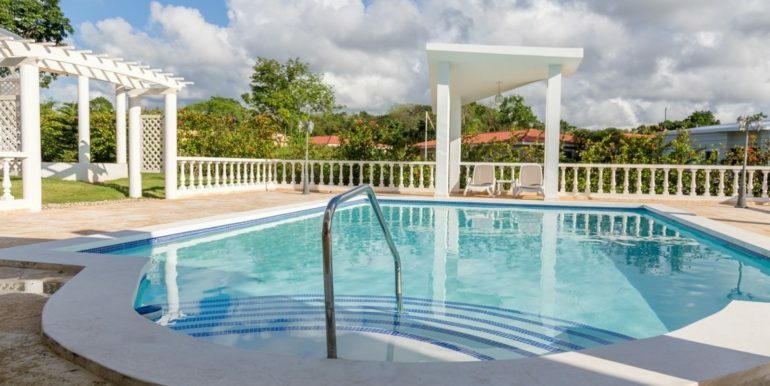 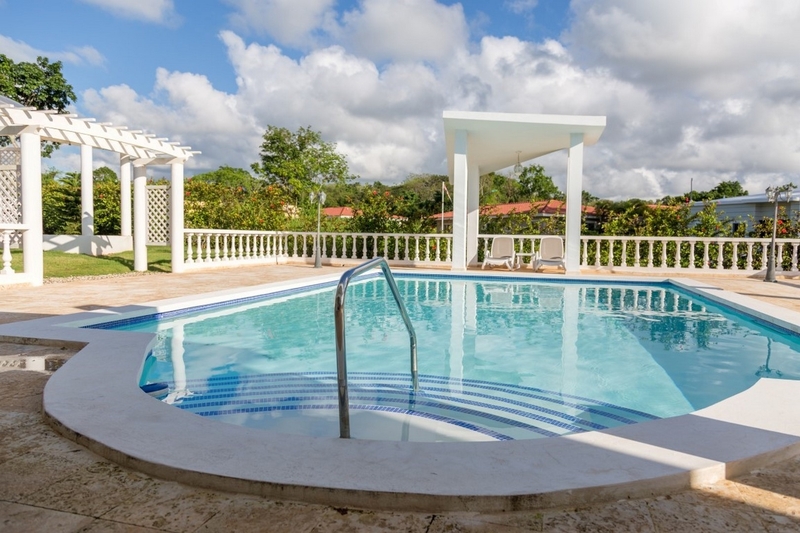 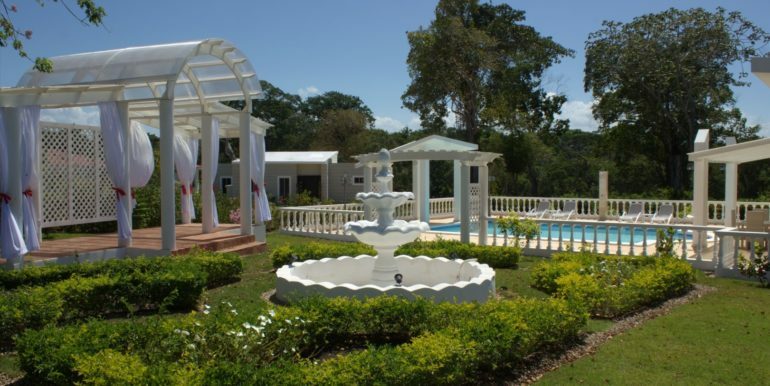 Out of the 100+ villa rental listings we have for Sosua, about 30% are 2 bedroom units. 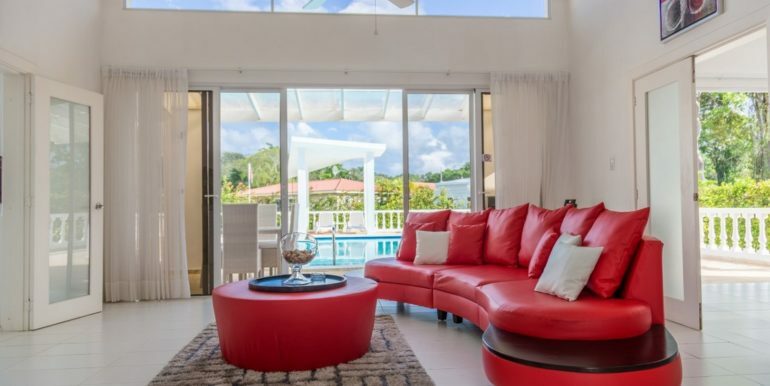 And out of those, few can entertain the senses like this 2 bedroom, 2 bathroom chic-style rental with a modern architecture that beautifully represents its owner`s vision. 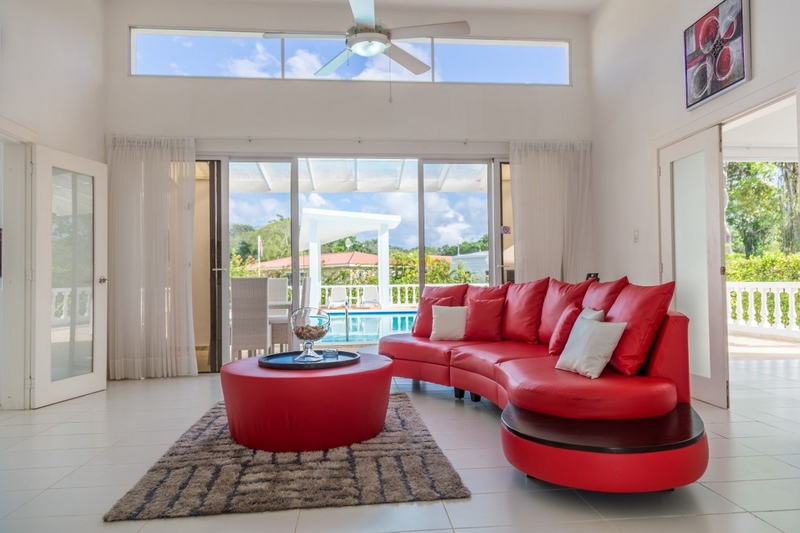 This villa is built on one floor, centering the ample living room between the suites; its high ceilings glass paned walls and sliding doors allowing natural light and the outdoor views in a pleasant way. 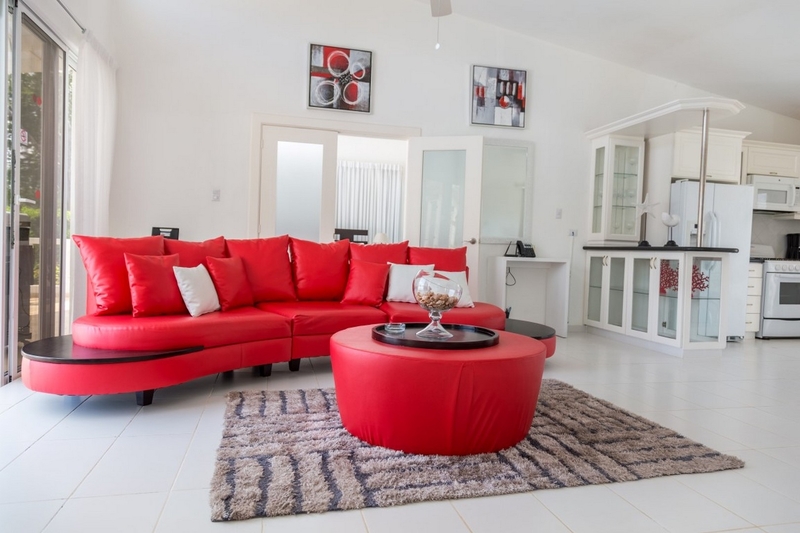 The living room in this villa is spacious, an all-white design with accent framed art and a flashy red leather sofa with matching red coffee table, topped in black. 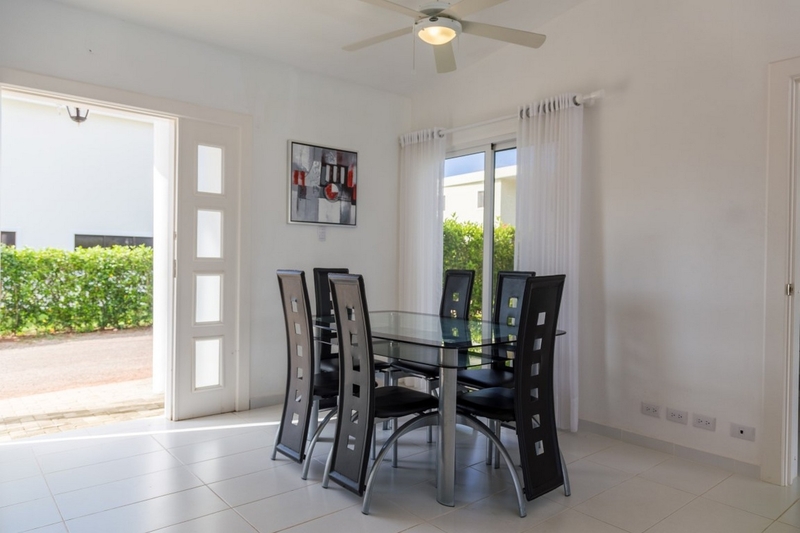 The dining table is black with double glass top and aluminum legs, high backed. 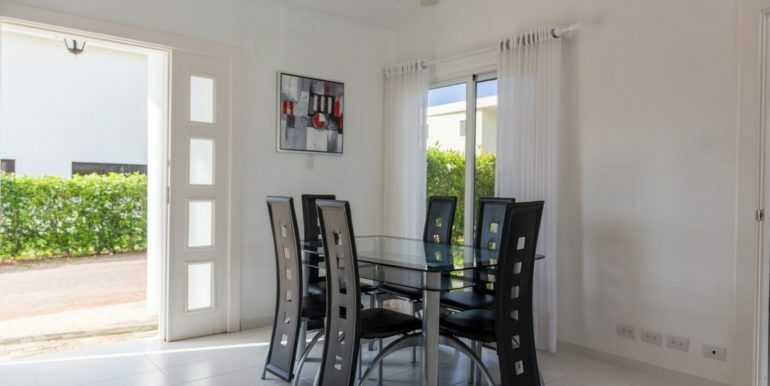 White curtains and railings keep contrast at a minimum, and the white door frames create a canvas illusion when looking at a piece of art with reds and grays. 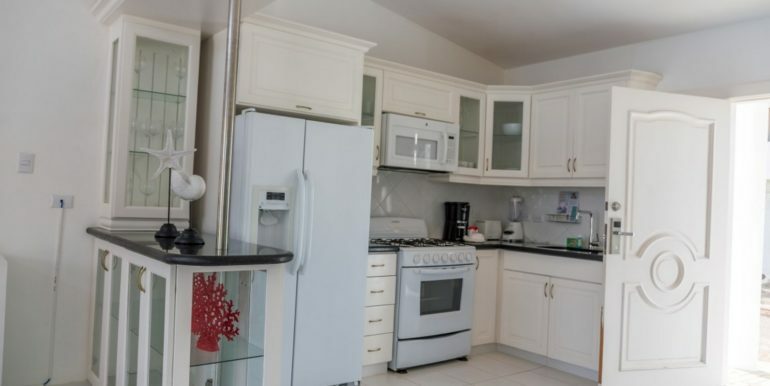 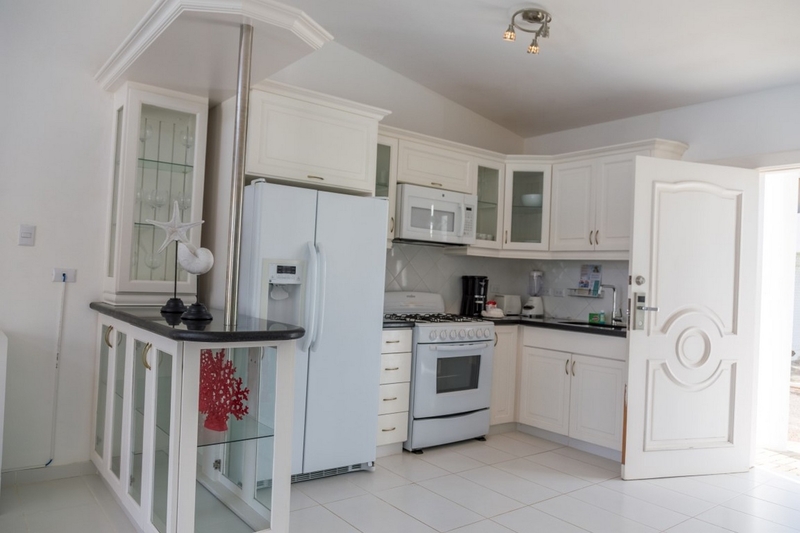 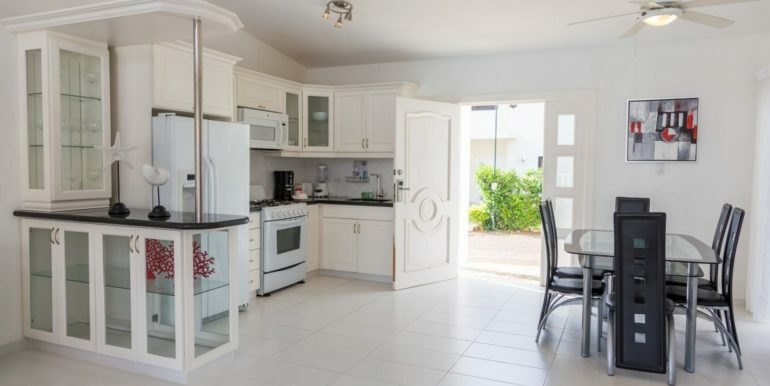 The kitchen sits on the right corner, with beautiful light cream white cabinets, white appliances and black countertops. 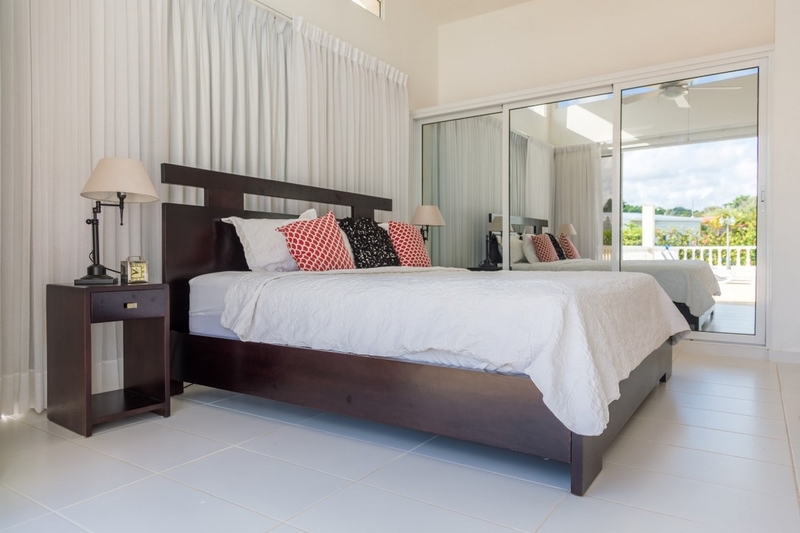 Nautical motifs remind us this is a vacation house styled like a city penthouse. 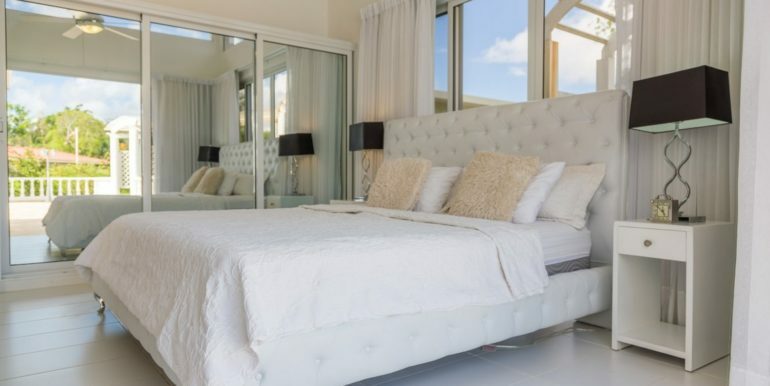 Each villa bedroom feels high end, specially the master suite with quilted high back bed, white linens, curtains and mirrored closets. 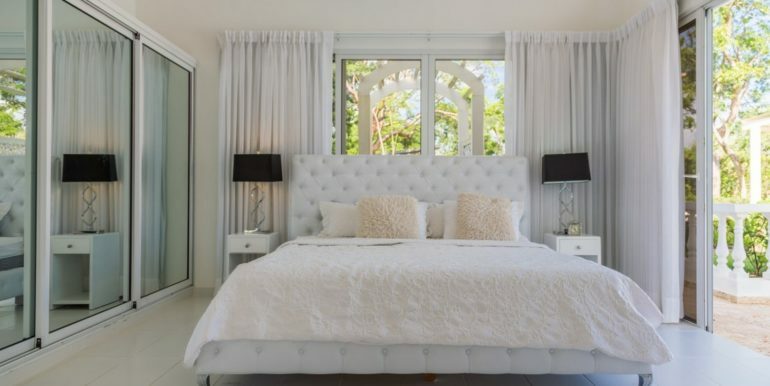 Square shaped side tables bear signature lamps in black, and light tan colored furry cushions bring the perfect balance to the overall décor. 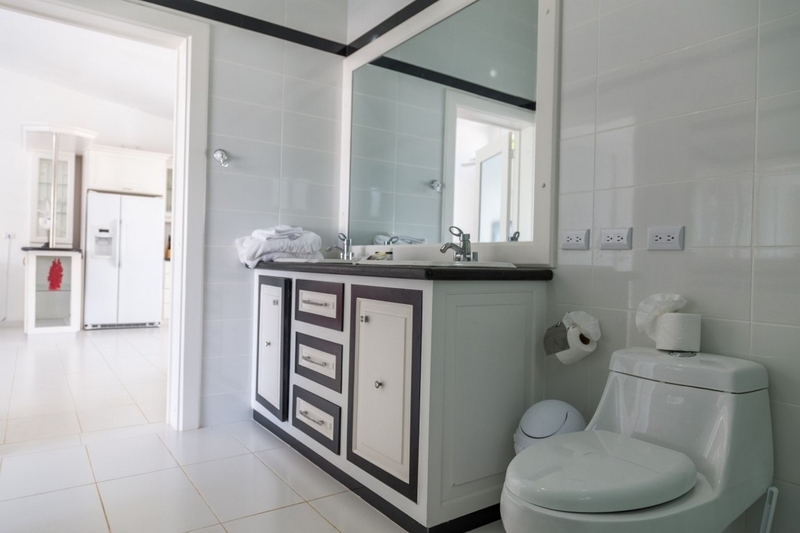 The bathroom has the same high quality cabinets as the rest of the villa, with black top, double vanities and imported fixtures. 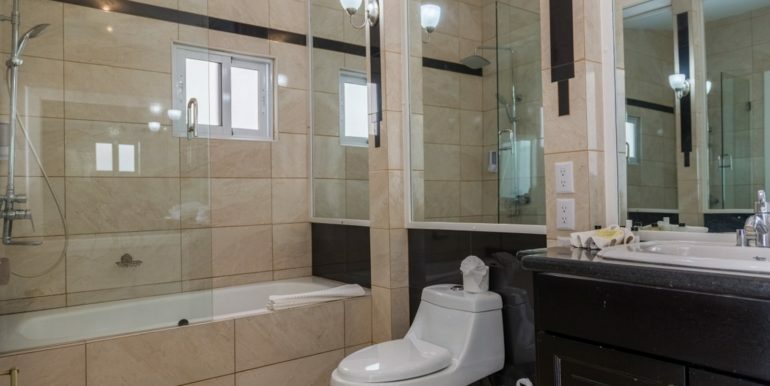 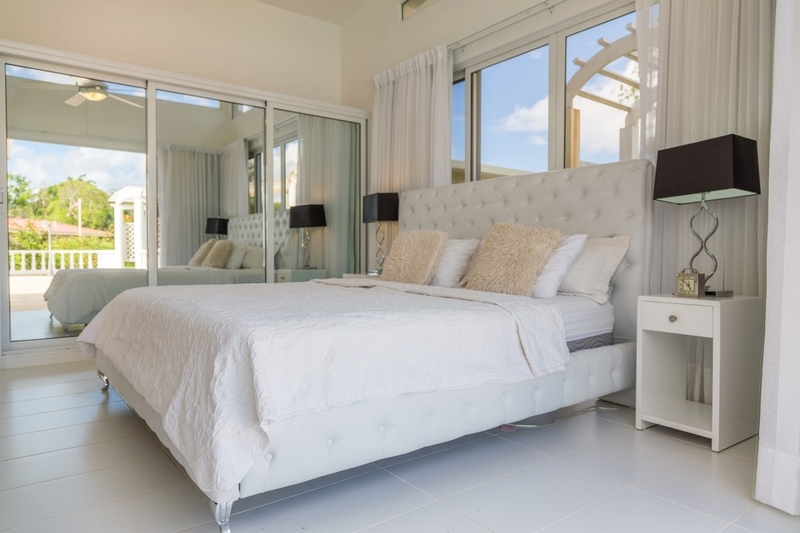 Floor to ceiling white tiling and sliding glass door shower with rain shower head is what one would expect as the pièce de resistance for such a splendid master suite in a Sosua Villa Rental. 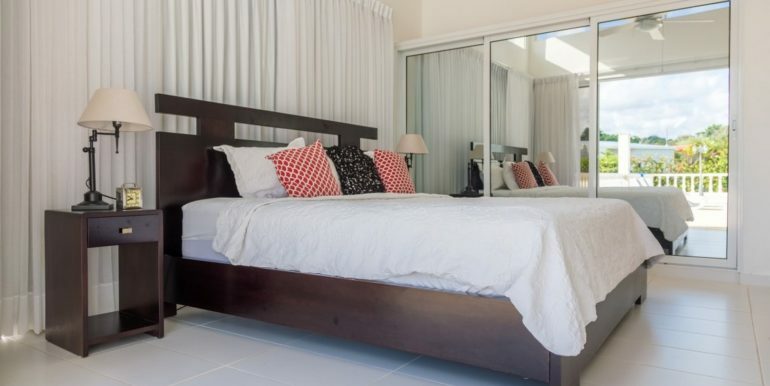 The guest suite has a dark brown bed, with gorgeous matching side tables and white curtains. 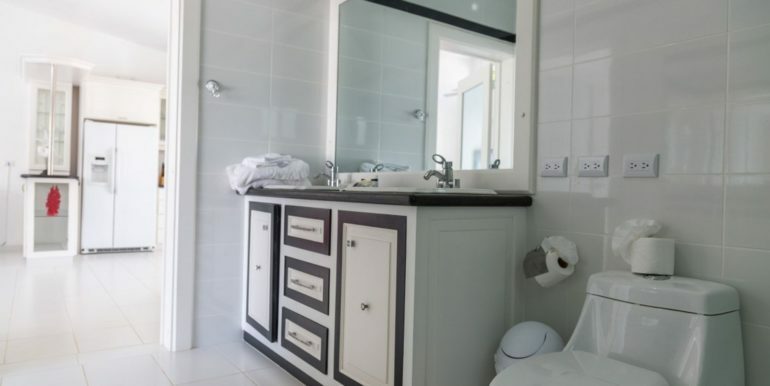 The guest suite bathroom is also fully tiled with exquisite faux marble tiling from floor to ceiling, light salmon colored which beautifully contrasts with the white tub, WC and black cabinets. 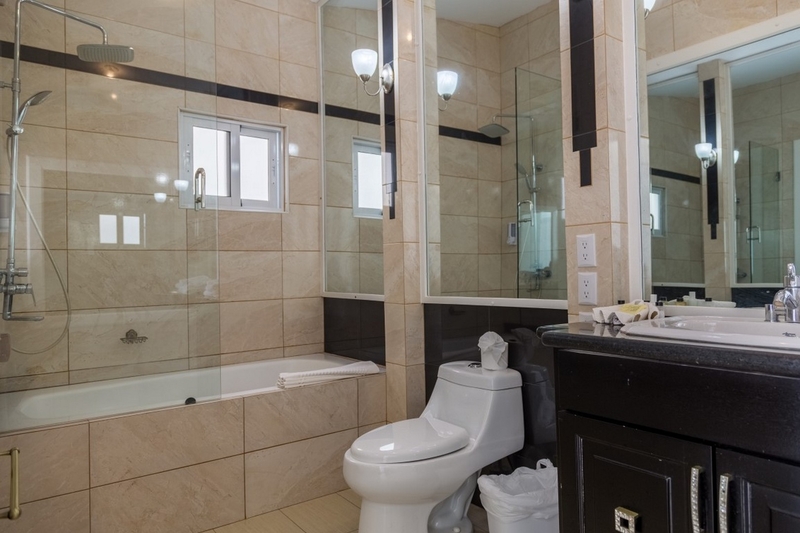 This bathroom also has the rain shower head as the master bathroom. 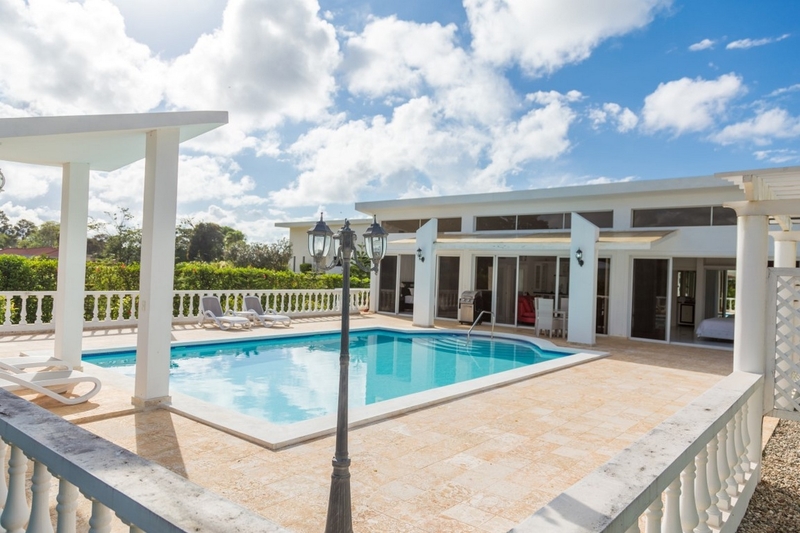 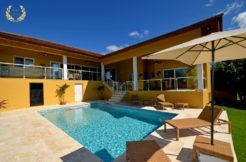 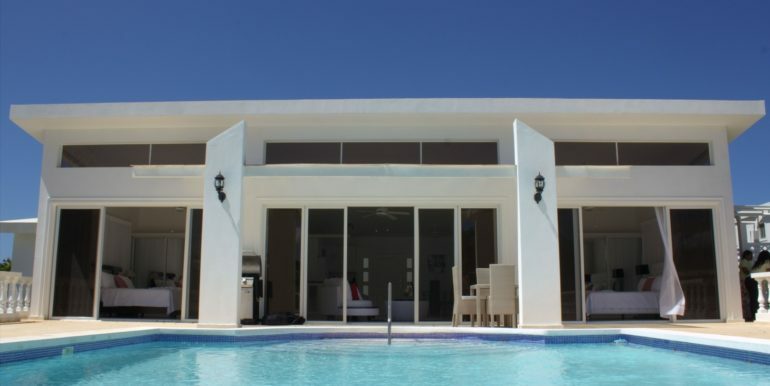 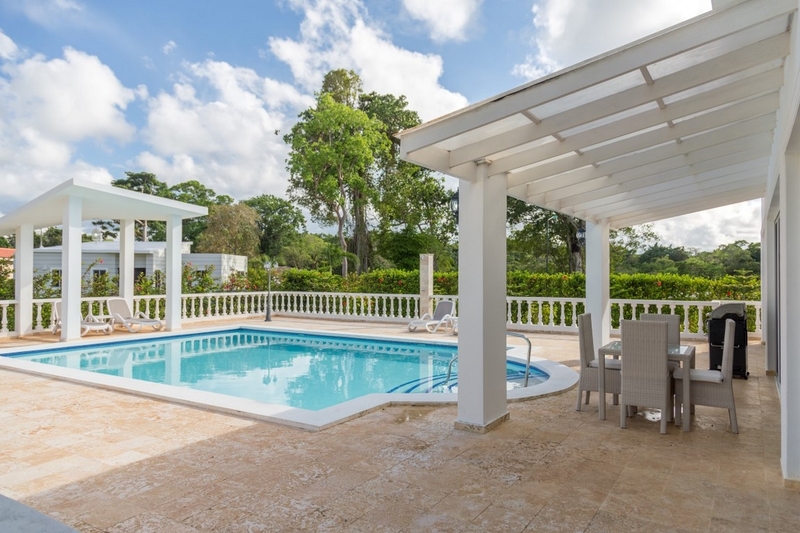 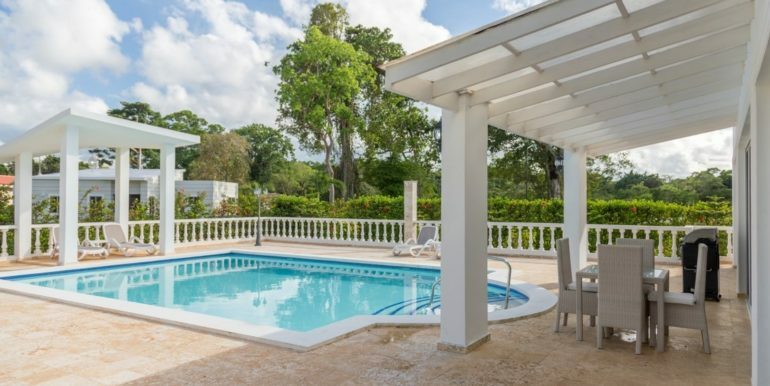 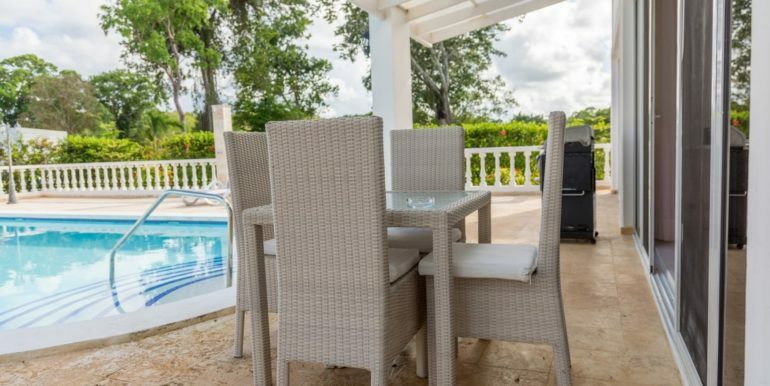 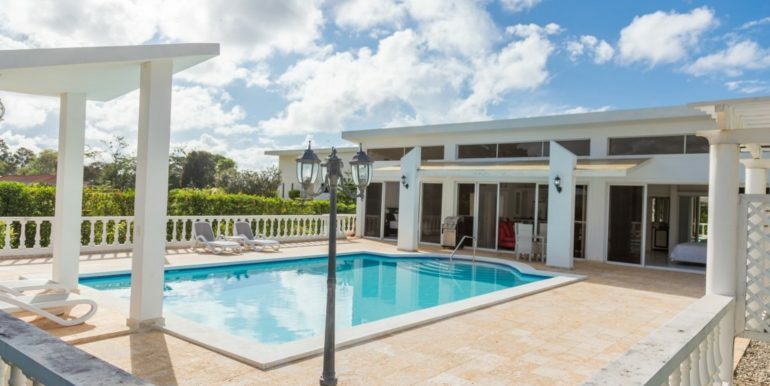 This villa in particular has a manicured garden area with an extended pergola, perfect for having a family dinner by the pool, or a romantic dinner for two. 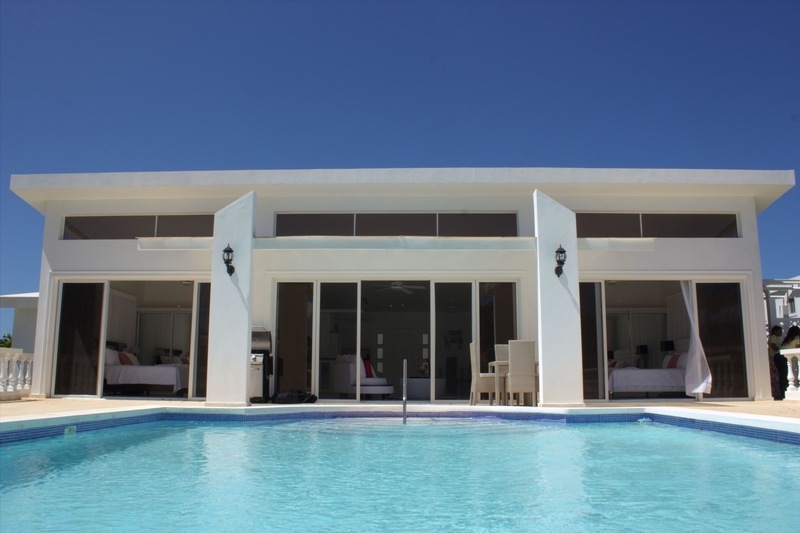 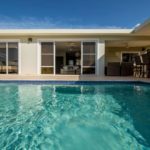 The garden area is noticeably more extensive than most 2 bedroom villas, and the coral deck surrounding the swimming pool shows extra space too. 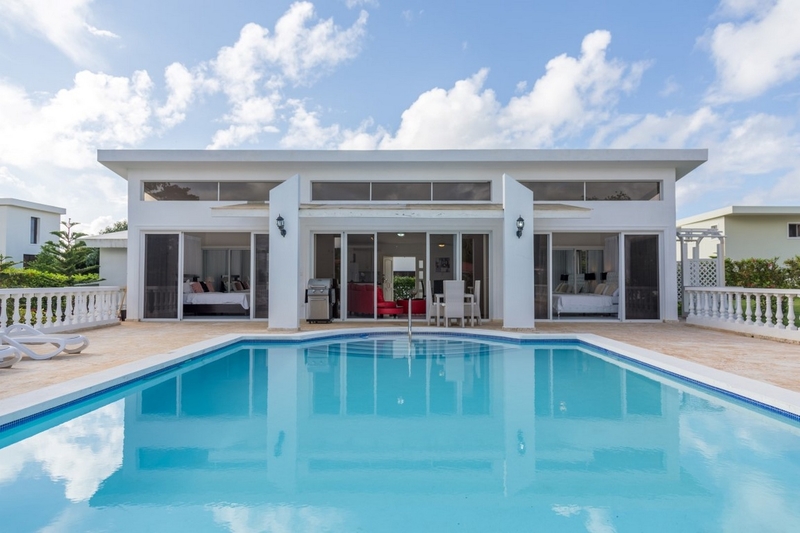 An overhang ceiling connects the house with the pool steps and its railing. 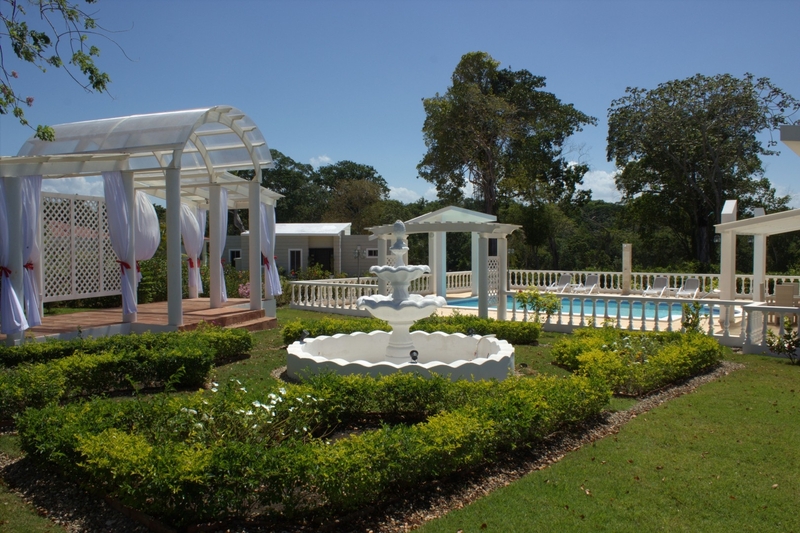 At the other end, a 3D design gazebo stands guard for the chaise lounges when the sun is at its peak and someone wants to get a shaded lounger. 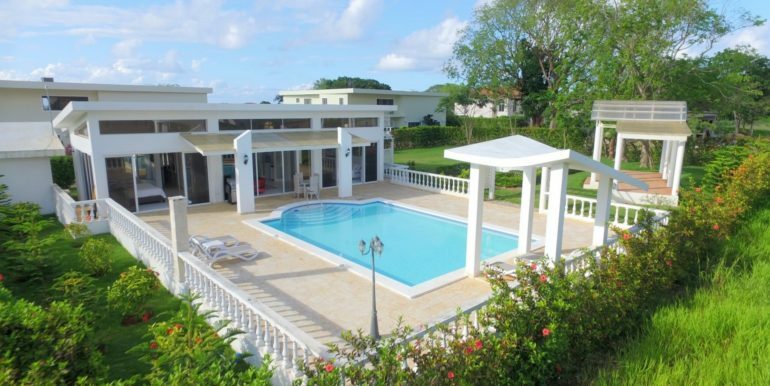 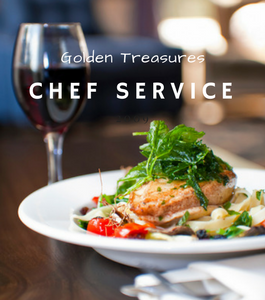 As with almost any villa offered by Golden Treasures, this one is fully equipped and includes air conditioned suites, ceiling fans, cable TV, WiFi, pool cleaning, maid service, and 24hr security ( please see attached terms and conditions). 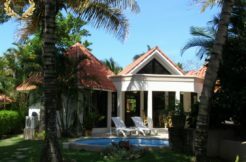 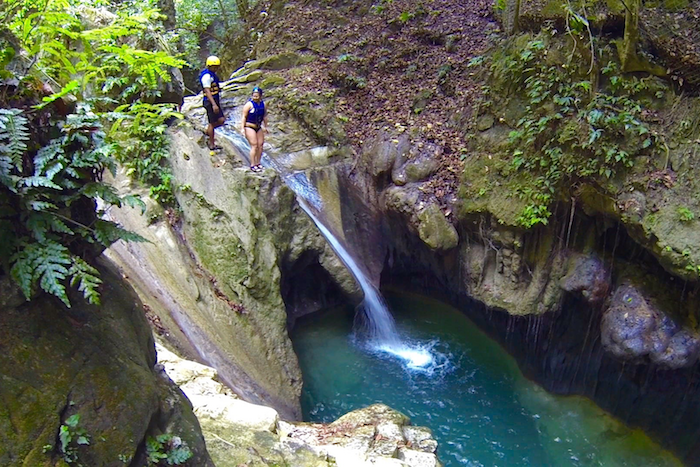 Sosua Beach is just a 5 minute drive from the villa, and the local POP airport 10 minutes away. 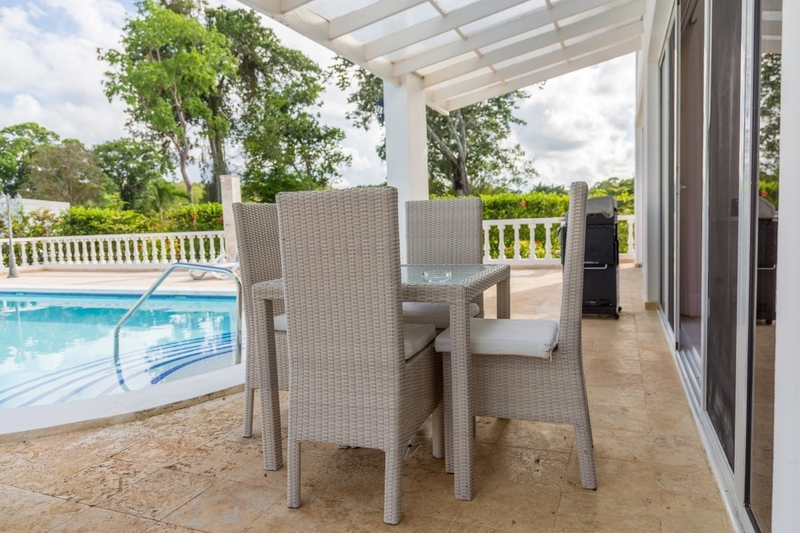 Villa Ref#SPC1569-840.